Download "Master of Arts (Counseling Psychology) M.A. (Counseling Psychology)"
4 including the importance of motivation and cognitive development in educational settings. Current educational psychology research. PC. 608 Differential Psychology 3 credits Prerequisite : PC.612 or consent of instructor The study of individual differences in intelligence, academic achievement, aptitude. Personality, vocational interests, and values. Group differences on these factors in terms of age, race, gender, social status, and other group factors PC. 612 Applied Statistics in Behavioral Science 3 credits The study of research methods and data analysis procedures including probability theory, sampling techniques, hypothesis testing, regression analyses, analyses of variance and covariance. Non-parametric statistics, and elementary multivariate statistics. PC. 613 Assessment in Counseling 3 credits Prerequisite : PG.612 The selection, administration, and analysis of the results of psychological tests of personality, intelligence, psychopathology, career interests, attitudes, and educational achievement as used by counseling psychologists. Students will prepare reports presenting the results of testing. PC. 614 Psychological Research 3 credits Prerequisite : PC.612 or consent of instructor Study of research methodology used in counseling psychology research. Analysis of published research with emphasis placed on scientific writing. Students will conduct original research in a relevant area of interest. PC. 618 Application of Computer Packages for Psychological Research 3 credits Prerequisite : PC.612 or consent of instructor Use of statistical programs for data organization, analysis, and presentation. PC. 626 Psychology of Social Behavior 3 credits The study of social psychology, personality structure and small group dynamics. Patterns of culture and values of group development, group forming, group process relating to personality and roles of group members, social behavior influenced by the group such as conformity and imitation. PC. 627 The Socio-Cultural Context of Human Behavior 3 credits The study of social and cultural influences on human behavior. Emphasis on selfperception and perception of others, group conformity, factors effecting behavior, control of deviant behaviors, the influence of social roles and values. The influence of cultural factors on behavior will also be investigated. PC. 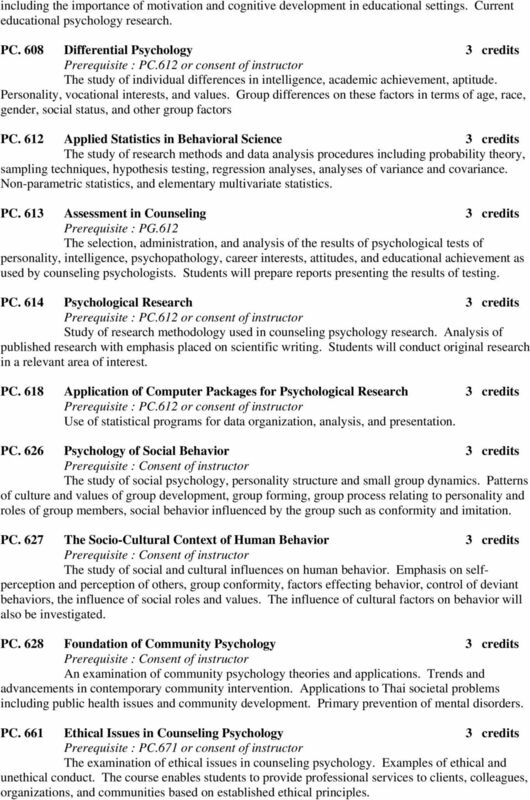 628 Foundation of Community Psychology 3 credits An examination of community psychology theories and applications. Trends and advancements in contemporary community intervention. Applications to Thai societal problems including public health issues and community development. Primary prevention of mental disorders. PC. 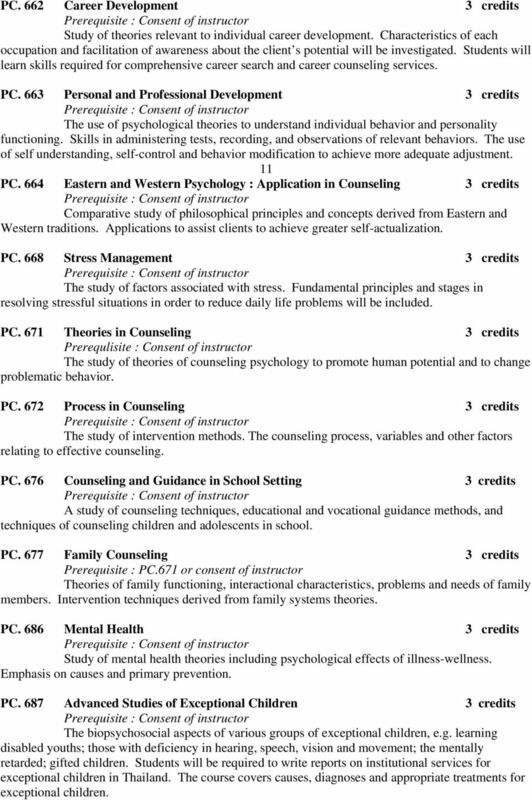 661 Ethical Issues in Counseling Psychology 3 credits Prerequisite : PC.671 or consent of instructor The examination of ethical issues in counseling psychology. Examples of ethical and unethical conduct. The course enables students to provide professional services to clients, colleagues, organizations, and communities based on established ethical principles. 5 PC. 662 Career Development 3 credits Study of theories relevant to individual career development. Characteristics of each occupation and facilitation of awareness about the client s potential will be investigated. Students will learn skills required for comprehensive career search and career counseling services. PC. 663 Personal and Professional Development 3 credits The use of psychological theories to understand individual behavior and personality functioning. Skills in administering tests, recording, and observations of relevant behaviors. The use of self understanding, self-control and behavior modification to achieve more adequate adjustment. 11 PC. 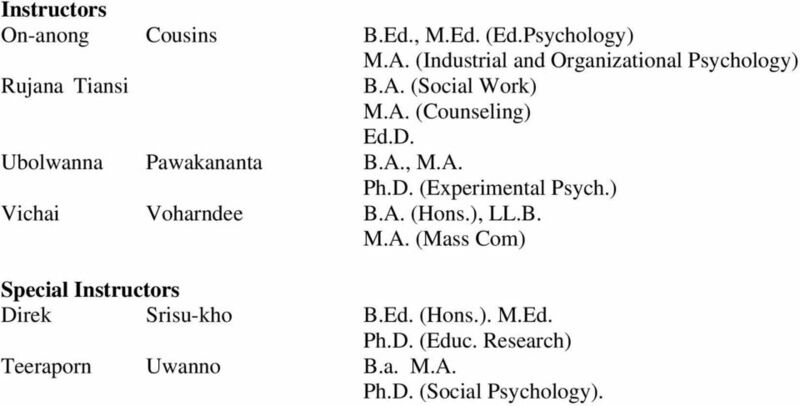 664 Eastern and Western Psychology : Application in Counseling 3 credits Comparative study of philosophical principles and concepts derived from Eastern and Western traditions. Applications to assist clients to achieve greater self-actualization. PC. 668 Stress Management 3 credits The study of factors associated with stress. Fundamental principles and stages in resolving stressful situations in order to reduce daily life problems will be included. PC. 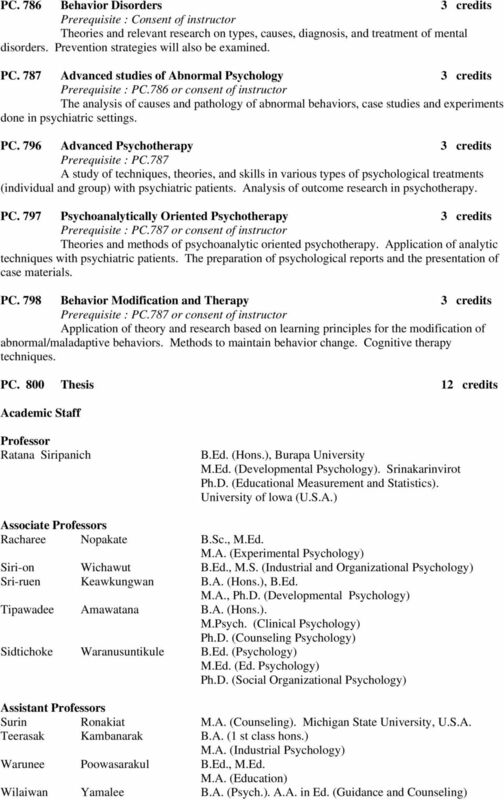 671 Theories in Counseling 3 credits Prerequlisite : Consent of instructor The study of theories of counseling psychology to promote human potential and to change problematic behavior. PC. 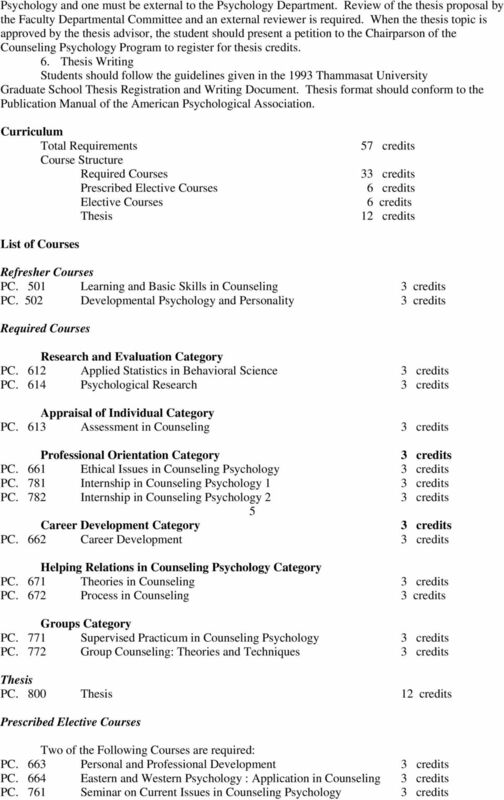 672 Process in Counseling 3 credits The study of intervention methods. The counseling process, variables and other factors relating to effective counseling. PC. 676 Counseling and Guidance in School Setting 3 credits A study of counseling techniques, educational and vocational guidance methods, and techniques of counseling children and adolescents in school. PC. 677 Family Counseling 3 credits Prerequisite : PC.671 or consent of instructor Theories of family functioning, interactional characteristics, problems and needs of family members. Intervention techniques derived from family systems theories. PC. 686 Mental Health 3 credits Study of mental health theories including psychological effects of illness-wellness. Emphasis on causes and primary prevention. PC. 687 Advanced Studies of Exceptional Children 3 credits The biopsychosocial aspects of various groups of exceptional children, e.g. learning disabled youths; those with deficiency in hearing, speech, vision and movement; the mentally retarded; gifted children. Students will be required to write reports on institutional services for exceptional children in Thailand. The course covers causes, diagnoses and appropriate treatments for exceptional children. 6 PC. 728 Social Problems and Adjustment 3 credits Study of social problems and their causes. Prevention techniques leading to healthy adjustment. The influence of social environments and institutions which result in psychological difficulties. PC. 761 Seminar on Current Issues in Counseling Psychology 3 credits Prerequisite : PC.772 or consent of instructor Examine and discuss current issues and research findings in counseling psychology. Emphasis will be placed on clinical applications to major societal problems. PC. 766 Career Planning 3 credits Prerequisite : PC.662 or consent of instructor Study of the plans and preparation of clients for effective work in various organizations. Techniques of promoting effective and appropriate job placement of individuals according to their aptitudes and abilities. PC. 767 Career Resources 3 credits Prerequisite : PC.662 or consent of instructor Study of the services available in the career resource center. Use of data obtained from organizational settings. This course covers the applications of advanced technology for career development. PC. 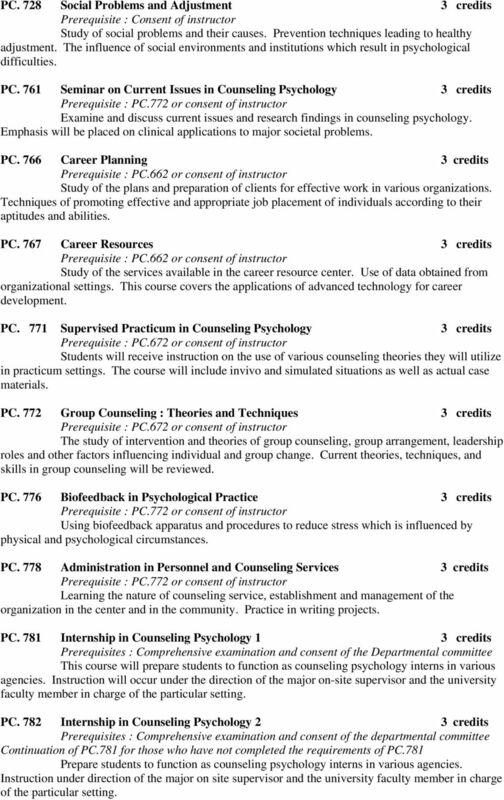 771 Supervised Practicum in Counseling Psychology 3 credits Prerequisite : PC.672 or consent of instructor Students will receive instruction on the use of various counseling theories they will utilize in practicum settings. The course will include invivo and simulated situations as well as actual case materials. PC. 772 Group Counseling : Theories and Techniques 3 credits Prerequisite : PC.672 or consent of instructor The study of intervention and theories of group counseling, group arrangement, leadership roles and other factors influencing individual and group change. Current theories, techniques, and skills in group counseling will be reviewed. PC. 776 Biofeedback in Psychological Practice 3 credits Prerequisite : PC.772 or consent of instructor Using biofeedback apparatus and procedures to reduce stress which is influenced by physical and psychological circumstances. PC. 778 Administration in Personnel and Counseling Services 3 credits Prerequisite : PC.772 or consent of instructor Learning the nature of counseling service, establishment and management of the organization in the center and in the community. Practice in writing projects. PC. 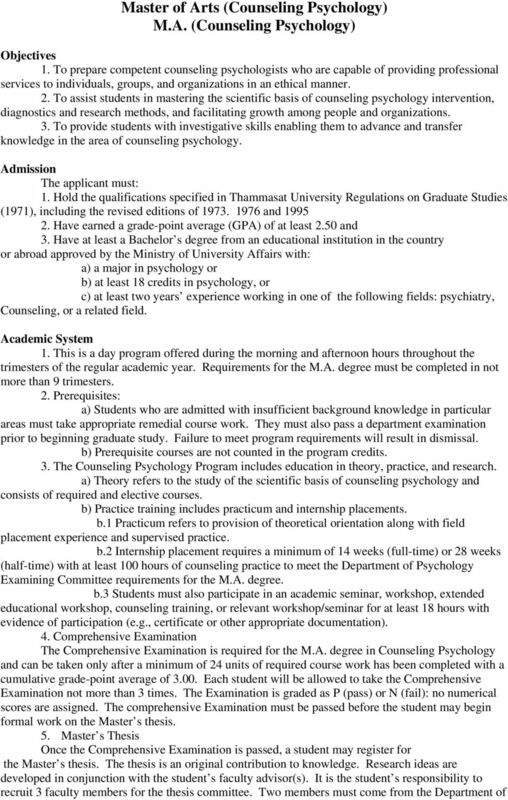 781 Internship in Counseling Psychology 1 3 credits Prerequisites : Comprehensive examination and consent of the Departmental committee This course will prepare students to function as counseling psychology interns in various agencies. Instruction will occur under the direction of the major on-site supervisor and the university faculty member in charge of the particular setting. PC. 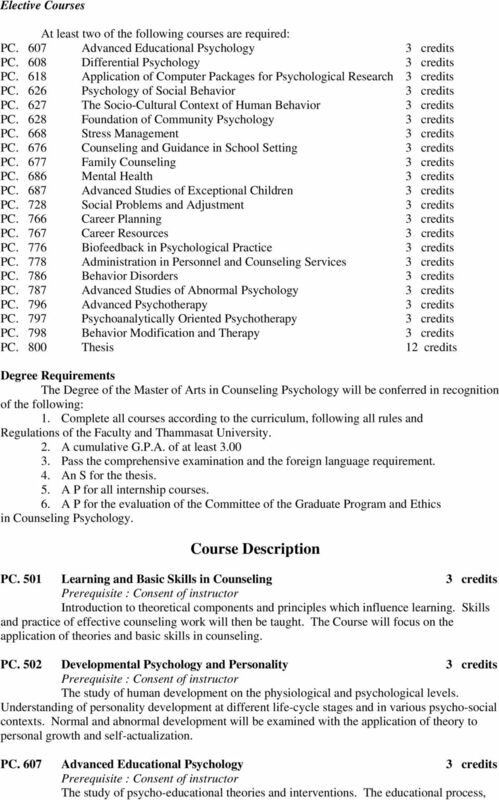 782 Internship in Counseling Psychology 2 3 credits Prerequisites : Comprehensive examination and consent of the departmental committee Continuation of PC.781 for those who have not completed the requirements of PC.781 Prepare students to function as counseling psychology interns in various agencies. Instruction under direction of the major on site supervisor and the university faculty member in charge of the particular setting. 8 Instructors On-anong Cousins B.Ed., M.Ed. (Ed.Psychology) Rujana Tiansi M.A. (Industrial and Organizational Psychology) B.A. (Social Work) M.A. (Counseling) Ed.D. Ubolwanna Pawakananta B.A., M.A. Ph.D. (Experimental Psych.) Vichai Voharndee B.A. (Hons. ), LL.B. M.A. (Mass Com) Special Instructors Direk Srisu-kho B.Ed. (Hons.). M.Ed. Ph.D. (Educ. Research) Teeraporn Uwanno B.a. M.A. Ph.D. (Social Psychology). PSYCHOLOGY Web: http://www.emporia.edu/psych Visser Hall 327, Campus Box 4031, Phone: (620)341-5317, Fax: (620) 341-5801 Brian W. Schrader, Chair Graduate Faculty Professors: Pamelyn MacDonald, James D.
250 ANDREWS UNIVERSITY EDUCATIONAL AND COUNSELING PSYCHOLOGY Bell Hall, Room #160 (616) 471-3113 ecp@andrews.edu http://www.educ.andrews.edu Faculty Jerome D. Thayer, Chair Lenore S. Brantley Nancy J.
B2aiii. Acquiring knowledge and practicing principles of ethical professional practice.